The clock tower that sat opposite the front door to 'Wheatly', the E.D. Morgan III estate designed by McKim, Mead & White between 1890-1900 in Old Westbury. Click HERE for more on 'Wheatly'. Photo from the Elizabeth Morgan Jay Etnier Hollins archives. Lovely. The landscaping is SOO crisp! Freshly cut and not a blade of grass out of place. Ever amazed by the dream vistas McK/M/W created for this place. Morgan must have been an interesting client. Crass cynic that I am, I wonder what the per hour cost to Morgan was of his time at Wheatly. sec word: gyreaden: What the pole dancer did. 1) The clock tower that looks like a sphere set in an oblisk. 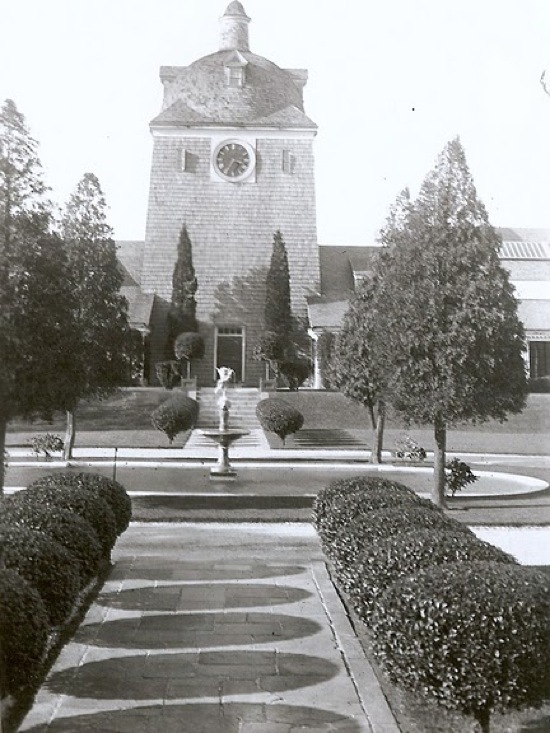 2)The round clock & round pool with a round fountain. 3) All those shrubs clipped into perfect balls, casting perfectly round shadows along the walk. This must have been a place where after you've looked at something you should look again ... because there's more. Is it safe to assume that this once stood on or near Clock Tower Road? Or am I way off once again? No you're correct. Clock Tower Road dead ends at the entrance court to what was Wheatly, hence the name. Off subject....Ethan Allen TV commercial...Old Westbury Gardens...correct me if I'm mistaken, but it sure looks like it from a distance. Regarding Sunnyside...what info are you looking for? I don't have any pictures which is why you don't find it on here. Does anyone know what happened to the clock tower? I have an old clock face that came from Long Island some years ago. This photo has the closest resemblance I have come across.